79.5 x 22 mm (3 1/8” x 7/8”), 8-page accordion, 101 copies. Binding: Nested accordion; covers are blue and white gingham cloth over boards. Title on label on cover. Housed in a slipcase covered in yellow paper and blue and white gingham cloth. Title on label on front. Paper: White and yellow, handmade by Peter Thomas. Printing: Digital. Typography: Reproduction of text handwritten by Donna Thomas. Illustration: Reproduction of a watercolor painting by Donna Thomas spanning entire accordion. Notes: Edition includes 75 numbered copies and 26 copies lettered A-Z. Made for the International Wizard of Oz Club. Thomas, Peter and Donna, “A106. 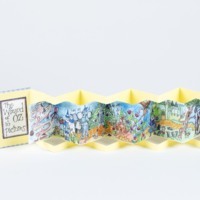 The Wizard of Oz in Pictures,” Digital Exhibits - UWM Libraries Special Collections, accessed April 22, 2019, http://liblamp.uwm.edu/omeka/SPC2/items/show/563.